Whether you will be raising a pint to the Queen for her Diamond Jubilee or just having a cup of tea, let's see if you can remember how much things used to cost back then. The Office of National Statistics says you cannot compare like with like. In 1977 it priced a pint bottle of beer, not draught. Even so, it was less than 40p, compared with closer to £3 a pint today – a rise of 618%. You can't compare the price of tea bags between 1977 and today because tea bags were not commonly used in 1977 – we used loose-leaf tea and a tea strainer. Tea bags were not included in the ONS inflation basket until 1979. On the other hand, motorists can get a good idea of how costs have risen. The Queen's Silver Jubilee in 1977 was the first year the price of petrol was used in the inflation basket. Then it cost the equivalent of 18p a litre. In January this year it was £1.33. Diesel was also 18p a litre in 1977 – today it is £1.41, a rise of 683%. Government statisticians regularly compare the prices of a shopping trolley of goods to come up with the inflation figures. Every now and then an item that has lost popularity is replaced by a new item that has become more popular. The latest was lipstick replaced by lip gloss. But some items have been in the basket for decades. That would suggest the traditional British breakfast has soared in price. Bacon has gone up a blood vessel busting 370%. Sausages have shot up a sizzling 342%. Eggs have scrambled themselves a 460% rise. And your two slices of white bread or toast with that have risen a staggering 700% in those 35 years. Have wages kept up? The statisticians point out that their methodology has changed so it's not entirely fair to compare ONS wage figures for 1977 with today, but what the hell? In 1977 the average weekly wage was 20 pence over £70. Today, using a different calculation, it is £465 - that's a rise of 562%. So our daily bread is costing us a lot more of our dough. Stay in and watch TV? Perhaps at those prices you're thinking of staying home and watching the Jubilee on the telly? Well according to the TV Licensing people, in January 1977 a black and white licence cost £8 and a colour licence £18. The current price of a colour TV Licence is £145.50 and a black and white licence is £49. A colour licence has gone up 708% - even more than bread. In January 1977 there were approximately 18.1 million licences in force. There are now more than 25 million. In 1977 approximately 10 million were colour TV Licences and 8.1 million were for black & white. In January of this year, there were more than 25 million colour licences and about 16,000 black and white licences. And there's loads more rubbish to watch on the TV. But it is reassuring to know some things never change. Apparently, in the south-east this year, there are the worst drought conditions since 1976. The average water bill in the UK this year is £376, according to regulator OfWat. In 1977 water services and rates were still run by local councils so OfWat has no figures, but A Hansard record of the debate in the Lords in April 1977 on the Water Charges Equalisation Bill reports average domestic bills for water supply ranged from £25.40 in Wales to £15 in the Thames area. That £15 bill was said to be 15% below the national average. So, the national average was about £17.65, that's an increase in water bills from 1977 of 2030%. Water bills are now 21 times as much as in 1977. And we still have exactly the same problems - with drought when it doesn't rain and blocked drains causing flooding when it does. So much for the benefits of competition and free-market capitalism. How about, for one day only, we all get to eat drink and be merry on 1977 prices? 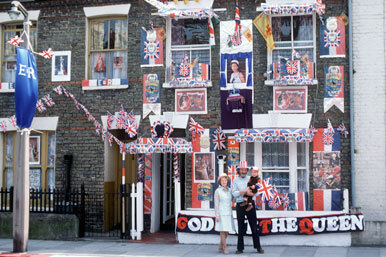 Now that would be a great way to celebrate the Queen's Diamond Jubilee.